Vainly attempts to elevate Riddick into a mythological hero in a political-intrigue contest meant to be Dune in an action context, though it's a lot more like Stargate in a crap context. 119 min. Universal Pictures. Director: David Twohy. Cast: Vin Diesel, Colm Feore, Thandie Newton, Judi Dench, Karl Urban. The one good thing about The Chronicles of Riddick comes at the bitter end of its two-hour-girth. The film ends with an election year-joke about having to trust "the lesser of two evils" to wield the power of an empire. The even bigger joke is that the ending of The Chronicles of Riddick serves as an open door to two presumable sequels in a planned Chronicles of Riddick trilogy, but writer-director David Twohy (Below) and star Vin Diesel can start making other plans. This epically bad, self-important, portentous star vehicle (for a dim star, at that) is itself a sequel, to 2000's Pitch Black. While not exactly a world-beater, Pitch Black was an amusing B-movie in the things-that-go-bump-in-the-night vein, with nocturnal creatures slaughtering humans, and Diesel's night-vision anti-hero reluctantly saving lives. 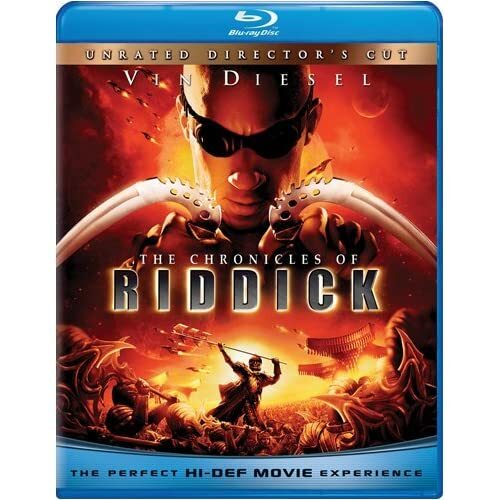 The Chronicles of Riddick vainly attempts to elevate Riddick into a mythological hero in a political-intrigue contest meant to be Dune in an action context, though it's a lot more like Stargate in a crap context. Here, the superhuman Riddick (who professes, "I just wanted to be left alone") dodges bounty hunters until winding up on Helion, a planet ravaged by the tyrannical Lord Marshal (Colm Feore) and his army of "Necromongers." Anyway, Riddick runs afoul of Marshal, winds up jailed in a subterranean prison, then slowly but surely fights his way out to an eventual climactic confrontation with the supernaturally powerful Marshal. Along the way, Riddick renews his prickly relationship with a woman named Kyra (Alexa Davalos, subbing for Pitch Black's Rhiana Griffith), and chats up femme fatale Thandie Newton and a shimmering Judi Dench (! ), playing ambassador of the "Elementals." 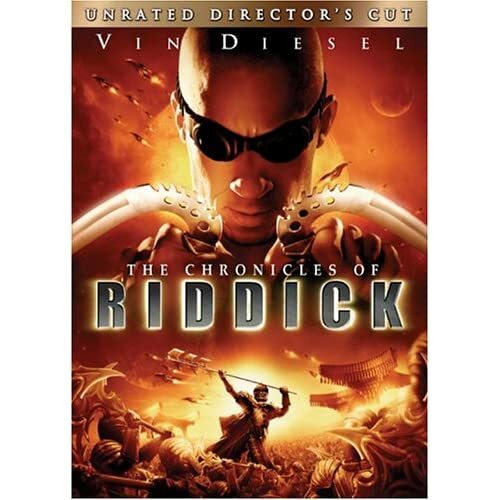 Not surprisingly, The Chronicles of Riddick devastates good actors like Feore, Newton, and Dench; it's a wonder any of them can keep a straight face, save for their presumable depression. The story is one long, computer-painted piss-and-vinegar bath with horrible action scenes (diced beyond recognition by no less than three editors), head-scratching plot turns, hideous production design, and abominable dialogue ("He's not a man—he's a holy half-dead who has seen the Underverse and returned to..."—you get the idea). This movie is strictly for Matrix junkies needing a fix of grungy post-punk action, irredeemably silly buff deadpan, and action movie "bon mots" ("Find him. Whatever it takes. Find him!, "Not my fight," "I bow to no man," etc.) Me? I just wanted to be left alone. 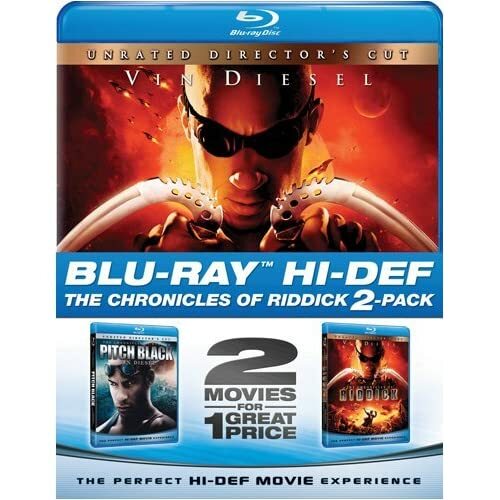 The Blu-ray debut of The Chronicles of Riddick will be a treat for the film's fans. The hi-def A/V treatment includes a picture-perfect image and thunderous DTS-HD Master Audio 5.1 mix in its presentation of the Unrated Director's Cut (featuring approximately fifteen minutes of new footage). In even better news, the film is available in a nice-priced two-pack with its superior prequel Pitch Black. Bonus features are extensive, beginning with a feature commentary by writer-director David Twohy and actors Karl Urban and Alexa Davalos. Universal's patented U-Control offers a Picture in Picture track; Complete Chronicles, which allows the viewer to "explore the history and mythology of Riddick" with clips from both films and extensive expository narration; Chronicles Compendium, which breaks down the categories of Races, Worlds, Beliefs and Key Players into numerous data files; and Anatomy of a Fight, allowing viewers to "investigate select fight scenes to demonstrate the real-life science of Riddick's hand-to-hand combat skills." There's an "Introduction by David Twohy" (:45, SD), "Deleted Scenes" (8:02, SD) that come with optional commentary by Twohy, and a "Virtual Guide to The Chronicles of Riddick" (7:40, SD), a montage of imagery and narration giving audio-visual background to the film's universe of worlds, creatures, and characters. "Toombs' Chase Log" (9:56, SD) is a selection of log entries from Toombs, seen as part of a spaceship's navigational interface. The next four featurettes make up a conventional making-of doc (split in four). The first is "Visual Effects Revealed" (6:01, SD), including comments from Twohy, visual effects supervisor Peter Chiang, Rhythm and Hues compositing supervisor Sean McPherson, Rhythm and Hues digital effects supervisor Mike O'Neal, and Rhythm and Hues visual effects supervisor Mike Wassel. "Creation of New Mecca" (11:12, SD) shows set footage and includes interviews with Twohy, producer Scott Kroopf, Vin Diesel, Keith David, executive producer George Zakk, Dame Judi Dench, production designer Holger Gross, production illustrator Jim Martin, costume designer Ellen Mirojnick, prop master Tom Tomlinson, and New Deal Studios visual effects supervisor Ian Hunter. "Riddick Rises" (13:26, SD) does the same, with comments from Diesel, Twohy, Zakk, Kroopf, Gross, supervising art director Kevin Ishioka, Martin, Nick Chinlund, Davalos, fight cordinator Bradley James Allen, and stunt coordinator Bob Brown, while "Keep What You Kill" (17:30, SD) sits down Diesel, Twohy, Zakk, Kroopf, Colm Feore, Linus Roache, Karl Urban, Thandie Newton, Gross, conceptual artist Matt Codd, Mirojnick, costume supervisor Jim Tyson, make-up department head Victoria Down, and make-up designer Ve Neill. Lastly, the My Scenes bookmarking feature is paired with BD-Live capability to share the scenes online with friends. All site content © 2000-2019 Peter Canavese. Page generated at 04/20/2019 01:51:15AM.